Coding Standards are an important factor for achieving a high code quality. A common visual style, naming conventions and other technical settings allow us to produce a homogenous code which is easy to read and maintain. However, not all important factors can be covered by rules and coding standards. Equally important is the style in which certain problems are solved programmatically - it’s the personality and experience of the individual developer which shines through and ultimately makes the difference between technically okay code or a well considered, mature solution. These guidelines try to cover both, the technical standards as well as giving incentives for a common development style. These guidelines must be followed by everyone who creates code for the Flow core. Because Neos is based on Flow, it follows the same principles - therefore, whenever we mention Flow in the following sections, we equally refer to Neos. We hope that you feel encouraged to follow these guidelines as well when creating your own packages and Flow based applications. 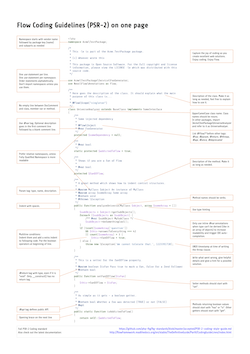 The most important parts of our Coding Guidelines in a one page document you can print out and hang on your wall for easy reference. Does it get any easier than that? Some people may object to the visual guidelines since everyone has his own habits. You will have to overcome that in the case of Flow; the visual guidelines must be followed along with coding guidelines for security. We want all contributions to the project to be as similar in style and as secure as possible. Almost every PHP file in Flow contains exactly one class and does not output anything if it is called directly. Therefore you start your file with a <?php tag and must not end it with the closing ?>. The copyright header itself must not start with /**, as this may confuse documentation generators! * This file is part of the YourCompany.Package package. Code lines are of arbitrary length, no strict limitations to 80 characters or something similar (wake up, graphical displays have been available for decades now…). But feel free to break lines for better readability if you think it makes sense! Make sure you use the correct license and mention the correct package in the header. Since we adopted PSR-2 as coding standard we use spaces for indentation. Here’s a code snippet which shows the correct usage of spaces. * Returns the name of the currently set context. Naming is a repeatedly undervalued factor in the art of software development. Although everybody seems to agree on that nice names are a nice thing to have, most developers choose cryptic abbreviations in the end (to save some typing). Beware that we Neos core developers are very passionate about naming (some people call it fanatic, well …). In our opinion spending 15 minutes (or more …) just to find a good name for a method is well spent time! There are zillions of reasons for using proper names and in the end they all lead to better readable, manageable, stable and secure code. As a general note, english words (or abbreviations if necessary) must be used for all class names, method names, comments, variables names, database table and field names. The consensus is that english is much better to read for the most of us, compared to other languages. When using abbreviations or acronyms remember to make them camel-cased as needed, no all-uppercase stuff. Admittedly there are a few places where we violate that rule willingly and for historical reasons. The base for namespaces as well as package keys is the vendor namespace. Since Flow is part of the Neos project, the core team decided to choose “Neos” as our vendor namespace. The Object Manager for example is known under the class name Neos\Flow\ObjectManagement\ObjectManager. In our examples you will find the Acme vendor namespace. Why do we use vendor namespaces? This has two great benefits: first of all we don’t need a central package key registry and secondly, it allows anyone to seamlessly integrate third-party packages, such as Symfony2 components and Zend Framework components or virtually any other PHP library. Think about your own vendor namespace for a few minutes. It will stay with you for a long time. All package names start with an uppercase character and usually are written in UpperCamelCase. In order to avoid problems with different filesystems, only the characters a-z, A-Z, 0-9 and the dash sign “-” are allowed for package names – don’t use special characters. The full package key is then built by combining the vendor namespace and the package, like Neos.Eel or Acme.Demo. Only the characters a-z, A-Z and 0-9 are allowed for namespace and class names. Namespaces are usually written in UpperCamelCase but variations are allowed for well established names and abbreviations. Class names are always written in UpperCamelCase. The unqualified class name must be meant literally even without the namespace. Class names must be nouns, never adjectives. The name of abstract classes must start with the word “Abstract”, class names of aspects must end with the word “Aspect”. \Neos\Cache\Backend\File File The class doesn’t represent a file! When specifying class names to PHP, always reference the global namespace inside namespaced code by using a leading backslash. When referencing a class name inside a string (e.g. given to the get-Method of the ObjectManager, in pointcut expressions or in YAML files), never use a leading backslash. This follows the native PHP notion of names in strings always being seen as fully qualified. If you refer to other classes or interfaces you are encouraged to import the namespace with the use statement if it improves readability. If importing namespaces creates conflicting class names you might alias class/interface or namespaces with the as keyword. Only the characters a-z, A-Z and 0-9 are allowed for interface names – don’t use special characters. Exception naming basically follows the rules for naming classes. There are two possible types of exceptions: generic exceptions and specific exceptions. Generic exceptions should be named “Exception” preceded by their namespace. Specific exceptions should reside in their own sub-namespace end with the word Exception. At first glance this feels oddly inconsistent; We do, after all, put each of those at the same position within php code. But, I think leaving Abstract as a prefix, and Interface/Trait as suffixes makes sense. Consider the opposite of how we do it: “Interface Foo”, “Trait Foo” both feel slightly odd when I say them out loud, and “Foo Abstract” feels very wrong. I think that is because of the odd rules of grammar in English (Oh! English. What an ugly inconsistent language! And yet, it is my native tongue). “Abstract” can be a noun, an adjective, or a verb. But, we want the adjective form. “Interface” is a noun or a verb. “Trait” is always a noun. So, based on current English rules, “Abstract Foo”, “Foo Interface” and “Foo Trait” feel the most natural. English is a living language where words can move from one part of speech to another, so we could get away with using the words in different places in the sentence. But that would, at least to begin with, feel awkward. So, I blame the inconsistent placement of Abstract, Interface, and Trait on the English language. All method names are written in lowerCamelCase. In order to avoid problems with different filesystems, only the characters a-z, A-Z and 0-9 are allowed for method names – don’t use special characters. Make method names descriptive, but keep them concise at the same time. Constructors must always be called __construct(), never use the class name as a method name. The following example shows two variables with the same meaning but different naming. You’ll surely agree the longer versions are better (don’t you …?). As a special exception you may use variable names like $i, $j and $k for numeric indexes in for loops if it’s clear what they mean on the first sight. But even then you should want to avoid them. It is, by the way, a good idea to use constants for defining regular expression patterns (as seen above) instead of defining them somewhere in your code. Names of files containing code for unit tests must be the same as the class which is tested, appended with “Test.php”. Files are placed in a directory structure representing the namespace structure. You may use PSR-0 or PSR-4 autoloading as you like. We generally use PSR-4. Contains the class \Neos\Flow\Tests\Unit\Package\PackageManagerTest which is a PHPUnit testcase for Package\PackageManager. Some things are not specified in PSR-2, so here are some amendments. $neos = 'A great ' . In a nutshell: before coding a feature or fixing a bug, write an unit test. Whatever you do: before committing changes to the repository, run all unit tests to make sure nothing is broken! To have a clear and focused history of code changes is greatly helped by using a consistent way of writing commit messages. Because of this and to help with (partly) automated generation of change logs for each release we have defined a fixed syntax for commit messages that is to be used. Never commit without a commit message explaining the commit! A feature change. Most likely it will be an added feature, but it could also be removed. For additions there should be a corresponding ticket in the issue tracker. A fix for a bug. There should be a ticket corresponding to this in the issue tracker as well as a new) unit test for the fix. A security related change. Those must only be committed by active contributors in agreement with the security team. Anything not covered by the above categories, e.g. coding style cleanup or documentation changes. Usually only used if there’s no corresponding ticket. Except for SECURITY each of the above codes can be prefixed with WIP to mark a change work in progress. This means that it is not yet ready for a final review. The WIP prefix must be removed before a change is merged. The code is followed by a short summary in the same line, no full stop at the end. If the change affects the public API or is likely to break things on the user side, start the line with [!!!]. This indicates a breaking change that needs human action when updating. Make sure to explain why a change is breaking and in what circumstances. Then follows (after a blank line) a custom message explaining what was done. It should be written in a style that serves well for a change log read by users. If there is more to say about a change add a new paragraph with background information below. In case of breaking changes give a hint on what needs to be changed by the user. If the change fixes a bug, resolves a feature request or task. If the change relates to an issue but does not resolve or fix it. All code must be documented with inline comments. The syntax is similar to that known from the Java programming language (JavaDoc). This way code documentation can automatically be generated. A file contains different documentation blocks, relating to the class in the file and the members of the class. A documentation block is always used for the entity it precedes. Classes have their own documentation block describing the classes purpose. * Here may follow some detailed description about what the class is for. * Paragraphs are separated by an empty line. Additional tags or annotations, such as @see or @Flow\Aspect, can be added as needed. Properties of a class should be documented as well. We use the short version for documenting them. For a method, at least all parameters and the return value must be documented. A special note about the @param tags: The parameter type and name are separated by one space, not aligned. Do not put a colon after the parameter name. Always document the return type, even if it is void - that way it is clearly visible it hasn’t just been forgotten (only constructors never have a @return annotation!). Testcases need to be marked as being a test and can have some more annotations. Not all methods with a public visibility are necessarily part of the intended public API of a project. For Flow, only the methods explicitly defined as part of the public API will be kept stable and are intended for use by developers using Flow. Also the API documentation we produce will only cover the public API. To mark a method as part of the public API, include an @api annotation for it in the docblock. * This method is part of the public API. When something in a class or an interface is annotated with @api make sure to also annotate the class or interface itself! Otherwise it will be ignored completely when official API documentation is rendered! There are not only documentation annotations that can be used. In Flow annotations are also used in the MVC component, for defining aspects and advices for the AOP framework as well as for giving instructions to the Persistence framework. See the individual chapters for information on their purpose and use. Here is a list of annotations used within the project. They are grouped by use case and the order given here should be kept for the sake of consistency. Additional annotations (more or less only the @todo and @see come to mind here), should be placed after all other annotations. This section gives you an overview of Flow’s coding rules and best practices. When throwing an exception, make sure to provide a clear error message and an error code being the unix timestamp of when you write the ``throw`` statement. That error code must be unique, so watch out when doing copy and paste! Never use the object manager or factory in unit tests! If they are needed, mock them. 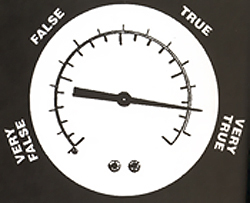 Avoid tests for the scope of an object. Those tests test the object factory, rather then the test target. Such a test should be done by checking for the presence of an expected @scope annotation – eventually we will find an elegant way for this. When concatenating paths, always use \Neos\Utility\Files::concatenatePaths() to avoid trouble. All code should be object oriented. This means there should be no functions outside classes if not absolutely necessary. If you need a “container” for some helper methods, consider creating a static class. All code must make use of PHP5 advanced features for object oriented programming. Avoid double-negation. Instead of exportSystemView(..., $noRecurse) use exportSystemView(..., $recurse). It is more logical to pass TRUE if you want recursion instead of having to pass FALSE. In general, parameters negating things are a bad idea. Bottom line is: You may (and are encouraged to) use inline comments if they support the readability of your code. But always be aware of possible design flaws you probably try to hide with them. This is also referred to as a bad “smell” in the theory of Refactoring. We highly recommend reading “Refactoring” by Martin Fowler - if you didn’t already.